There is nothing more quintessentially summer than blueberries. 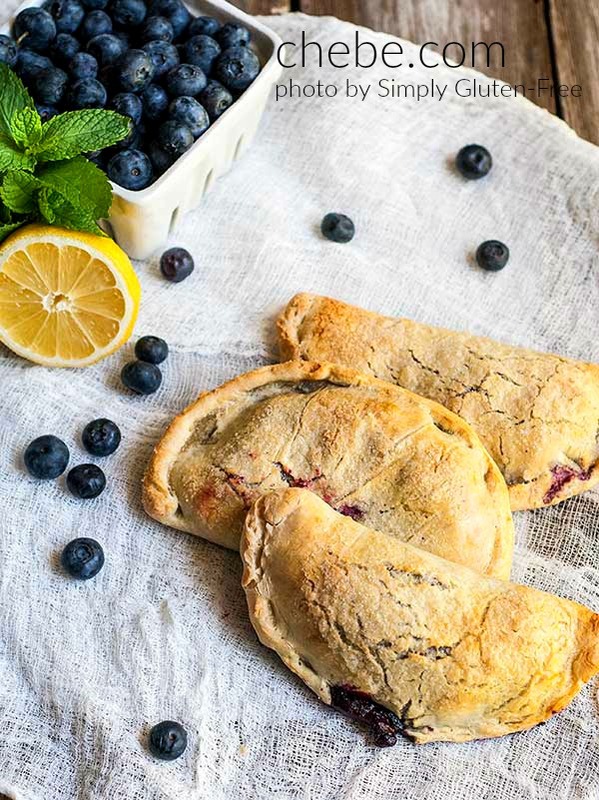 Gluten and grain free Blueberry Hand Pies made with Chēbē dough to be exact – perfect for picnics, beach trips, and hikes. 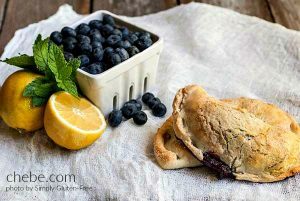 The Great Outdoors and Blueberry Pies – a perfect combo! Combine 1 1/2 cups blueberries in a saucepan with 1/4 cup of sugar, lemon juice and zest. Bring to a boil, reduce heat and simmer for 5 minutes or until the blueberries are very soft and start to burst. Combine the corn starch or tapioca starch with 2 Tbsp of water and stir into the blueberries. Increase heat, bring back to a boil, and boil until the mixture thickens, about 30 seconds. Combine the Chebe mix with 2 eggs, the oil or melted butter, and 4 Tbsp of water. Stir until just combined. Knead the dough with your hands until smooth, about 2 minutes. Place 1 piece of wax or parchment paper on your work surface, place a piece of dough on top with another piece of parchment paper, flatten into disk and roll into a 6 inch circle. Spread 2 heaping Tbsp of the cooled blueberry mixture on one half of the dough, leaving a 1/2 inch border around the edge. Fold the dough over, forming a half circle. Pinch the dough edges together, fold over to crimp and place on a parchment lined baking sheet. Repeat with the remaining dough and blueberries. Using a fork, pierce the top of the dough several times. Whisk the remaining egg with a splash of water, brush the top of the hand pies, and sprinkle with sugar. Bake for 20 minutes or until the crusts are lightly browned. Let cool. Frozen fruit could be used. You would have to let it thaw out first. The only draw back is that the fruit then is not as fresh, crispy and tasty.